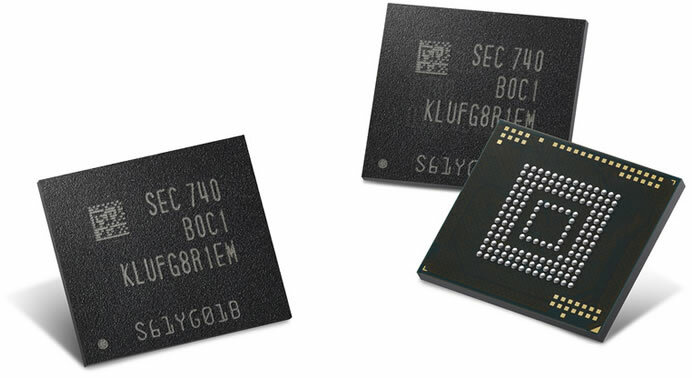 Samsung has begun mass production of the industry’s first 512-gigabyte (GB) embedded Universal Flash Storage (eUFS) solution for use in next-generation mobile devices. Utilizing Samsung’s latest 64-layer 512-gigabit (Gb) V-NAND chips, the new 512GB eUFS package provides unparalleled storage capacity and outstanding performance for upcoming flagship smartphones and tablets. The Samsung 512GB eUFS features strong read and write performance. With its sequential read and writes reaching up to 860 megabytes per second (MB/s) and 255MB/s respectively. The 512GB embedded memory enables transferring a 5GB-equivalent full HD video clip to an SSD in about six seconds, over eight times faster than a typical microSD card. 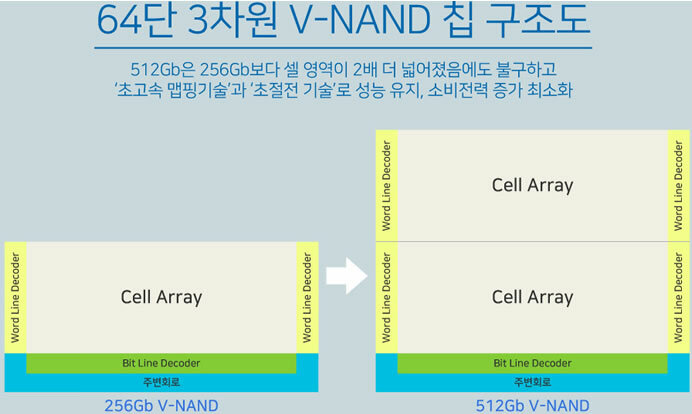 Consisting of eight 64-layer 512Gb V-NAND chips and a controller chip, all stacked together, Samsung’s new 512GB UFS doubles the density of Samsung’s previous 48-layer V-NAND-based 256GB eUFS, in the same amount of space as the 256GB package. The eUFS’ increased storage capacity will provide a much more extensive mobile experience. For example, the new high-capacity eUFS enables a flagship smartphone to store approximately 130 4K Ultra HD (3840×2160) video clips of a 10-minute duration, which is about a tenfold increase over a 64GB eUFS which allows storing only about 13 of the same-sized video clips. To maximize the performance and energy efficiency of the new 512GB eUFS, Samsung has introduced a new set of proprietary technologies. 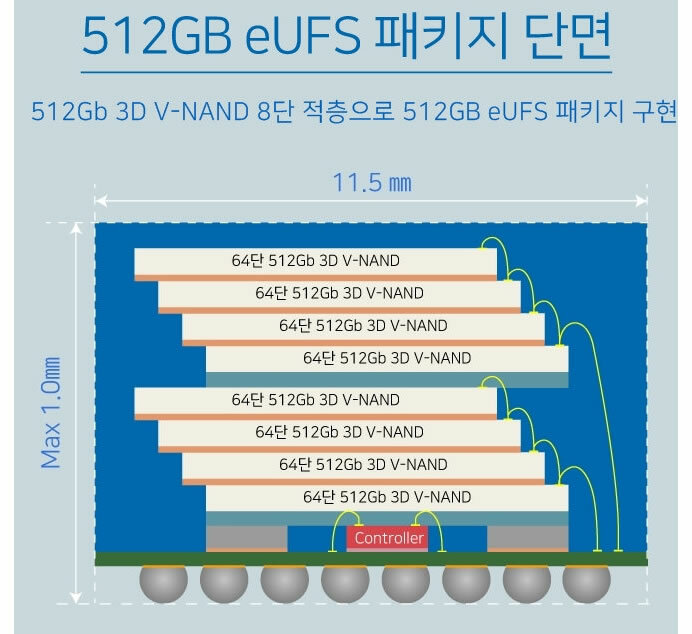 The 64-layer 512Gb V-NAND’s advanced circuit design and new power management technology in the 512GB eUFS’ controller minimize the inevitable increase in energy consumed, which is particularly noteworthy since the new 512GB eUFS solution contains twice the number of cells compared to a 256GB eUFS. In addition, the 512GB eUFS’ controller chip speeds up the mapping process for converting logical block addresses to those of physical blocks. For random operations, the new eUFS can read 42,000 IOPS and write 40,000 IOPS. Based on the eUFS’ rapid random writes, which are approximately 400 times faster than the100 IOPS speed of a conventional microSD card, mobile users can enjoy seamless multimedia experiences such as high-resolution burst shooting, as well as file searching and video downloading in dual-app viewing mode.